Happy Thursday! The DC area was bracing for a winter storm today and the chaos began early. People left work early, traffic got a bit crazy, and preparations were underway for a Friday of being stranded at home...yet it is 10:00 pm and not a snow flake has fallen...not even a rain drop. Sasha and I actually had a really nice, long walk outside. No snow storm this time, just another cold winter night! 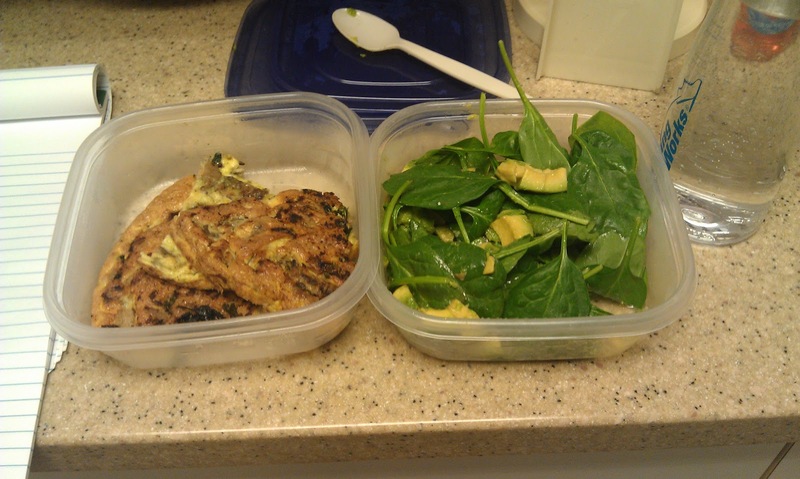 Here are my eats today! Same ole: Banana omelet with almond butter smeared on top. I ate it so fast that I forgot to take a picture! 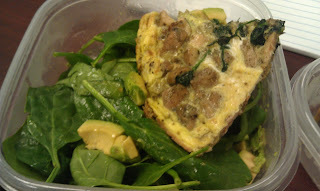 I had the other half of my roasted chicken frittata from last night on top of fresh spinach dressed with lemon juice and olive oil and a diced up avocado. I really heart avocados! I wish they grew on trees! Oh wait...they do?! Mixed things up a bit for dinner and went out! One of my favorite places in DC to go for tea and their outrageously good oatmeal salted cookies is Teaism. The Old Town location is right next door to Trader Joes, so I usually make it part of my grocery trip to stop in at Teaism for a cookie before I grocery shop. Tonight I sadly turned a cookie down but found some food options that were just as delicious. Teaism has an eclectic menu that is a mix of bento boxes, curries and tandoor breads. The menu itself is just fun to read! There are a few location in DC and the Old Town location is newly opened and rarely filled with people. It is a great space that is quiet and serene. I secretly hope people don't find out about how great it is so it can stay quiet and serene! After studying the menu before I got there ( a great tip for successfully going out to eat while on the Whole30), I decide to order the kelp noodles! Yes, first time for me to ever eat kelp noodles. I am not a fan of sea weed, so I was a little hesitant about kelp noodles, but they ended up tasting nothing like the ocean and really absorbed the flavors of everything that was mixed it. 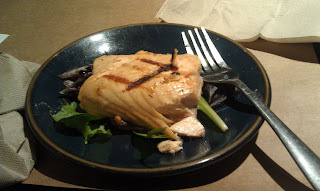 To add some protein, I also added a side of grilled salmon. Delicious! 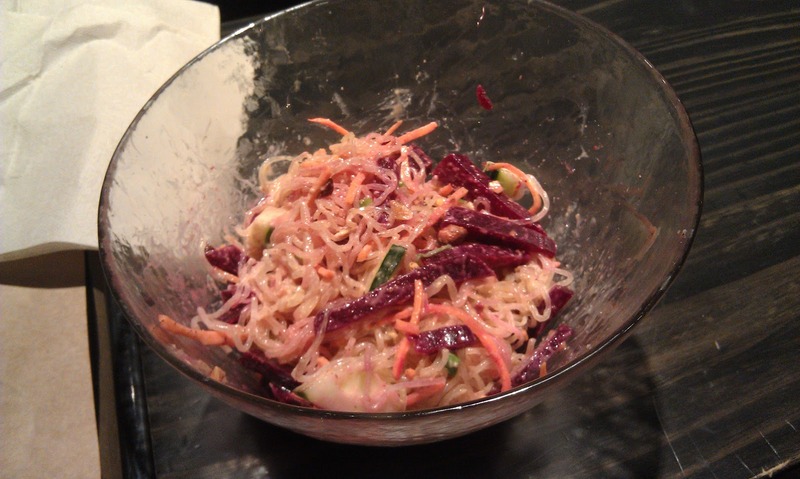 In the kelp salad was carrots, cucumbers and beets (all mixed in olive oil). Beets were also a first for me tonight and I think I like them! Like them a lot! I am certainly going to look for kelp noodles when I go to the grocery store next time. I really liked the texture and they would make a great addition to any salad or stir fry! No pictures, but had the standard small bag of almonds, apple and some dry mango after dinner. Another day down, we are in double digits tomorrow! I liked the term Teaism! Quiet and serene :) I love noodles.. Kelp noodles, I will try it for sure!